It is in this metropolis city of almost 8 million inhabitants where you will arrive entering Peru. By cruiser in the harbour of Callao or by airplane in the international airport of Jorge Chavez. He was a Peruvian aviation pioneer. The airport is located in Lima at approximately 45 minutes from the colonial center or the commercial districts as Miraflores, San Isidro, etc. 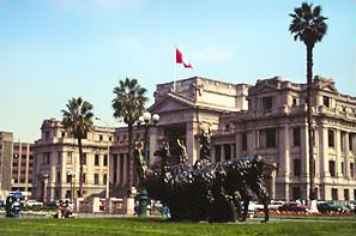 The Peruvian capital was established by the Spanish "conquistadores" in 1535.
he exclusive Lima of the rich. There is a beach resort coast with the nautical hobbies like wave surfing, cruisers and sailing. The new commercial center of Larco Mar in Miraflores, the most elegant restaurants of the country with view over the Pacific Ocean, its five star hotels. Also known is the Camino Real with its great shopping malls in San Isidro. The districts of artists, paintings, poets, writers, musician like Barranco, with its bars and pe�as (places where there is folkloric and also afro music as in the Andes or other regions of the country). The Checkerboard of Pizarro", founded by this conqueror in 1535. The city was organized until the beginning of this century as the center of life and economy. It was the Peruvian capital where the conquerors of the viceroy lived with people like "Perricholi". It was the City of the Kings. Today is Lima the city of chaos, contamination and street sellers (you can buy EVERYTHING. It's possible to build a house and to furnish it, without the need to go into a store!). In this part of the city there are the dayly traffic jams. Traffic is totally monstrous in crowd hours. The past few years things have improving a bit. The "ambulantes" or street vendors avoid the colonial city or got a place assigned by authority in one of the many commercial centers. Lot's of police and security agents diminished street crime to a low level. The most important squares and parks got a face-lift and look attractive these days. The mayor of Lima "Andrade" recently is reelected and will continue the good work. He and his staff designed an action plan to convert Lima in the tourist capital of Latin America. Peru has lot's of excellent archaeological material of any kind (ceramics, cloths, gold and silver objects money, etc.) which belong to numerous prestigious cultures : Chavin, Huari, Chimu, Mochica, Nazca, Paracas, Moxeque, Vicus, Inca, etc. Everybody can admire these fine objects of highly developed cultures in several museums in and around Lima, where these treasures are exposed. 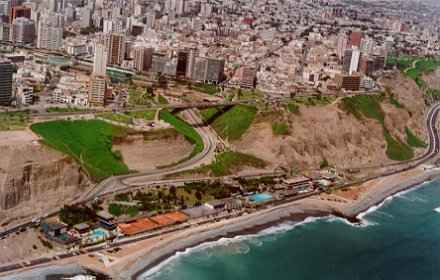 The oldest remains found in Lima are the settlements of fishermen in the valley of the Rimac River. In a later period the Proto-Lima culture is established with two mayor movements: the Aramburu and the Maranga. In the valley of Lima appeared the collas, originally from Canta and Huarochiri. In the last stage introduced the Incas their gods in this area but let the people continue worshipping their own religian. Pachacamac was a temple dedicated to the god of the Sun. The conquerer Francisco Pizarro founded Lima on the 18th of Januari 1535. They made Peru as the most important region of Latin America and a viceroy living in Lima represented the king of Spain. Jose de San Martin liberated Peru from the Spanish colonization and declared Peru independent the 28th of July 1821. Slavery was banished and Lima was for a long time considered as the best developed city of Latin America. 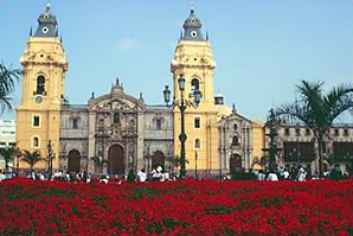 Lima was founded by the conqueror Francisco Pizarro on the 18th of January 1533. From the beginning on, this city was considered the new capital of Peru. The wealth imported by the Spanish nobility immigrated to Peru, made Lima originally the City of Kings. All gold was exported via this city to Spain. Many of the original colonial houses do still exist, but caused by the population explosion in the beginning of this century, Lima has lost a lot of its charm. Lima stayed a small city for almost 400 years. In the twenties the city population multiplied three times. Since the Second World War, Lima multiplied by a factor 10 (!). Today almost 8 million people live in the metropolis, almost a third from the total population of Peru (23 million). The population density has all extremes in Peru. For example: the tropical rainforest covers over 60% of the country's territory and only 5% of the population lives in this unmeasurable forest. Most of the emigrants come from the Andes. Since the new political climate in Peru a lot of investment has been done in hospitals, schools and universities. Most of the roads in bad quality were renewed. Many universities are private and expensive. Almost everybody that can afford university do their best to convert them into professionals. This is one of the only ways to secure future in Lima and earn good money. To give you an idea how young the economy is in Peru, the stock market of this country exists since the late 80s and stock values rose 10 times in 8 years. For the moment is the market relative stable and inflation depends upon the world market. Peru is the only country in the world where companies can put shares on the market of workers and employees. Peru wants to attract more labor-intensive industry. para la chica argentina el concurso nacional de caballos de paso es en mamacona, yo vivo muy cerca de ahi, en centro turistico mas cercano es distrito de Pachacamac hay varios hoteles de turistas. permitanme hacer una correcci�n, lima no es la ciudad del caos, es tan desordenada como cualquier gran capital de america. Your web page has improved tremenduously, I am pleased for you Dimitri, and still it is a sort of happiness to know how much you like and promote my Country. Yeah, sometime I open your Info peru and it's fantastic. All the best and a huge.